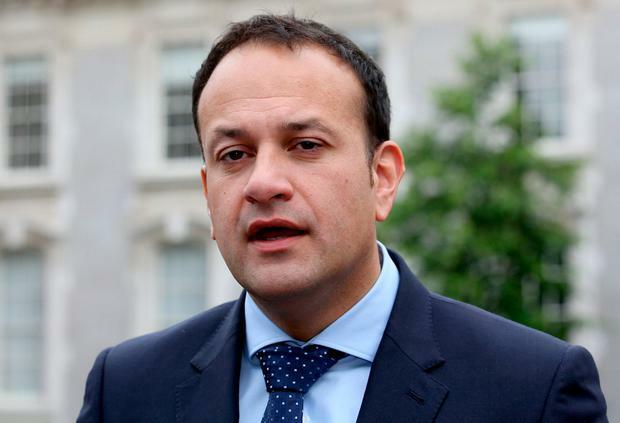 On his very first day, Leo Varadkar has insulted the hardworking people of Ireland by saying that he has no doubt that, only for Enda Kenny, the country as we know it would not be here today. What absolute and utter rubbish! I'm afraid Mr Varadkar has got it all wrong; it is the hardworking taxpayers who deserve the credit - those who suffered crippling pay cuts and all the painful austerity measures imposed by Michael Noonan under Mr Kenny's approval. It was also these same people who had to pay back the loans plus exorbitant interest to the glorified money lender, the IMF, to whom we had been forced to mortgage our country without any say from the ordinary citizens of Ireland. All our sacrifices have made the country what it is today - not Mr Kenny. However, Mr Varadkar is right about the second part of his statement: "I would like to add were it not for Enda Kenny I would not be standing in this seat today." He's definitely right there! After watching all the speeches to and about the departing Taoiseach, before and after the event, I realised how important sincerity is to our politicians. Once you can fake that, the Dáil is your wonderful, well-paid playground. Good morning, Taoiseach Leo Varadkar. I do hope you were up early this morning! I sincerely wish you every success in your new job. A wonderful achievement young man. Congratulations. Ireland has had a new leader pushed on us by default. He was not democratically elected by the Irish nation. Hardly fair play. Will it bring about a new dawn of equality, and sharing of wealth? Possibly, if a person still believes in fairy tales. Rhetoric makes very nice sound bites. However, it usually dies a death after the initial euphoria wears thin. Traditionally, Fine Gael has always been seen - from the little man's perspective - as a rich man's party. Nothing would suggest things are going to change much in the near future. The romance between Fine Gael and Fianna Fáil seems to be maturing into a full-blown marriage. Thus redemption from that quarter appears highly unlikely. Big fat pensions, and lump sum pay-offs. Dampen down any chance of a divorce this side of the next election. I'm afraid less well off people are paddling 'up the Swanee' without a canoe. So it's back to the future, and we remain trapped in a time warp. There are real reasons to be concerned at a DUP-Conservative link up in Britain. While holding office, several of the senior figures in the DUP attempted to implement the surely madcap doctrine of 'Young Creationism' in the North's school and university curricula, and in its museums. This particular belief-system eschews centuries of scientific and evolutionary research, in favour of a literal interpretation of the Christian-Judaic 'Adam and Eve' story. Centuries ago, Islamic and Judaic scholars turned their backs on this notion. So do the vast majority of Christians today. Its many other social and ideological viewpoints are, likewise, problematic. There is the persistent and well-founded charge of homophobia, as well as the issue of the DUP's perceived misogynistic and Islamophobic image. A former Conservative PM and others have warned of the possible 'undermining' of the Good Friday Agreement, in the event of an enduring DUP-Conservative pact. And there are also two major money-related stories, which have not gone away. It is hardly surprising, therefore, that the broad British electorate is more than a little jumpy at present. The concerns are real. They take your money, but do they give you a proper, personalised service. I refer in particular to Bank of Ireland, which has kept its branches open in Co Leitrim, but has established a certain monopoly. Its latest proposal is that the face-to-face, personalised service is being phased out and we will be expected to interact with machines. "Advice and self-service" is what it is calling this. To receive cheque payments, nowadays, we must have bank accounts. By Government directive, our incomes are paid into the banks and, then, we must almost fight to get them out. The banks are far too mean to pay proper teams of staff. If we have to ring up what was once our local bank, we are sent halfway around the world and the delays are most frustrating. Our present bank staffs are lovely, obliging people and that is why they must be kept available to help us out. The fact that incoming payments must come through our banks surely has a legal corollary - that we must be able to get our money out again whenever we need it. Often, this is not the case, as ATMs often break down. Every bank is in a town and if you live in the heart of rural Ireland, you are forced to make journeys to get what is your very own property. Our various banks were the undoubted villains during our country's financial collapse. That is why it galls me to hear of the massive salaries paid to their top executives. Because of their absolute meanness, these same fortress banks are, again, making billions in annual profits. There must be new emergency laws stating, one, that banks must employ a prescribed number of staff whose jobs will be give a personalised service and, two, that if a bank's ATM breaks down, the branch is fined and the fine money goes to the disappointed customers. The President of France says Brexit is a crime. No, Mr Macron, Brexit is not a "crime", it is the majority will of the British people. This is known as democracy, which is diminished on a daily basis by the EU as it seeks to be ruled over by two countries, Germany and France. The real crimes in Britain are the terrorist attacks against its people, along with matters like the terrible fire in London. Compared to these and the other tragedies life throws up regularly, Brexit takes a back seat. Arrogance has no place when civilised language concerning political discourse is entered into. At the National Gallery of Ireland, Arts Minister Heather Humphreys told Enda Kenny: "There's a lot more craic and mischief on the backbenches." I'm sure the homeless would have a lot more craic and sense of mischief on their 'park benches' if they had his salary and pension.